Here are just few tips on how to arrange different areas of your house according to Feng Shui. If you are seeking to improve your life through Feng Shui, it is necessary, that in the other areas of your house you will follow the same principles. Gr eenhouse usually serves not only as a place where the plants grow, but also as a very important area, intended for recreation and, perhaps, for meditation. If you are seeking to strengthen the spiritual side of your life, the most suitable place for the greenhouse is the northern side of the house, but actually north - is not the best direction for gardening, so you may need to find a compromising solution. A good option would be the south-east, as it is supporting creativity. If the greenhouse is located in the southern part of the house, the activity of the energy flows can reach such an extent, when passion in the house may turn into aggression. The greenhouse, built in a shape of a circle is attracting a lot of "Yin" energy, so if it is used for recreation, this could be a good option. However, this room can be used for more physically active time-spending: as an office or as a game room, and in this case it is better to build it using more angular shape to establish the necessary balance. 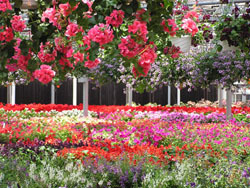 Arranging plants in the greenhouse is probably the most obvious way to nourish and strengthen the "Qi" energy, and by concentrating plants in some certain parts of the room, you can contribute to the positive changes in a certain aspects of your life or to ensure the welfare of a particular family member. The more plants are growing in the greenhouse, the denser is the shade, so do not forget about balance. Fans of Cactus will hardly find a greenhouse so good to have rest and relaxation. Other working areas, such as tailor's workshops or artistic studios, should, if possible, be located in the western part of the house to keep the creative principle, or in the southwest, where harmony and practical skills are getting the best support. Energy and dedication needed in these areas, also require a predominant influence of the "Yang" energy, so there should be used a very good lighting and some bright colors. The workplace should be oriented in the direction, favorable for the artist and be located in the fortunate sector of the room. It is important that whoever is in the room, he had the opportunity to see the door, either directly or by mirror, if it is not possible to arrange the workplace opposite to the door. In terms of Feng Shui too much of a garbage is harmful, so the room should be regularly and properly cleaned. To ensure the calm atmosphere in the children's room, it should be located on the north and the room for games should support creativity, so it's place would be in the western part of the house, but if you want your children to grow up fine and happy, then make their room in the south-western side of the house. You should make sure, that in this room there will always be a good flow of energy and try to keep it in order. Spacious closets, where you can easily put all toys, will help to keep a pleasant atmosphere in the room. The child's bedroom should have more significant influence of the "Yin" energy, and the room for games must have a stronger influence of the "Yang" energy. A video camera for observation, that is placed in the eastern part of the room, will help to ensure that children will grow up happy and healthy.